Simple air is one of the most powerful oxidizers for problem well water contaminants like iron, manganese, and hydrogen sulfide. The standard treatment strategy for these contaminants begins with oxidation, which causes the targeted contaminant to change from a dissolved state to a particle with a physical presence that can be caught by a filter. For example, in the presence of an oxidizing agent like ozone, chlorine, hydrogen peroxide or air, ferrous iron (also called clear water iron) becomes ferric iron (rust) suspended in water. The ferric iron can then be trapped by a filter. Air can be introduced into the water stream for oxidation by using a simple venturi valve, or by using a small air compressor, These methods require a separate aeration tank to give the air time to do its work. A more compact design that is gaining popularity, especially for applications where iron or sulfide content is not excessive, is a single-tank method that uses the same tank for aeration and filtration. This is a more passive approach than an air compressor. With the passive aeration system the top third of the treatment tank is used for aeration and the remainder of the tank contains the filter medium. Water enters the top of the tank, sprays down through a pocket of compressed air for oxidation of the contaminant, then filters down through the filter media which physically remove the contaminant. Filters of this type often use oxidizing media that are capable of working alone; in this case, the air greatly enhances their performance. 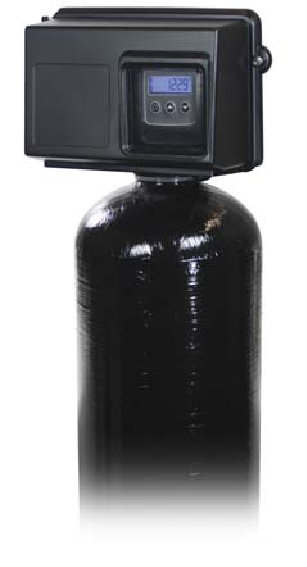 The passive air system is controlled by a control valve that is uniquely designed for use with this filter alone. It works by drawing air into the treatment tank the same way that a water softener draws brine into the resin tank. Regeneration must take place with relative frequency–usually every night or every other night in residential systems–for the air pocket to be maintained. Regeneration is a simple three-step operation. The filter is backwashed just as any iron filter would be by sending water upward through the media with enough force to lift the bed and wash impurities, like iron rust or sulfer, to drain. The next step, the longest in the regeneration cycle, uses a small internal venturi to pull air into the tank. The venturi is powered by a small stream of water. During this phase, air replaces the water in the tank, bathing the media in an oxygen-rich environment. In the final regeneration step, a rapid downward rinse of the media forces the air in the tank to the top, forming a compressed pocket for treatment. No air is introduced except during the regeneration phase, so regeneration must be performed fairly frequently to keep the air pocket fresh. Passive air systems are simple to set up, easy to install (as compared with external venturi and compressor systems), and they can be very effective at dealing with iron, hydrogen sulfide, and manganese.